Sometimes I look at a photo while researching posts for this blog, or stumble upon a youtube video, that sends me on a trip down memory lane. Sometimes, I see former Yankees that I’d forgotten all about, and that’s what this new post series is all about. Today, I was watching videos of improbable Yankees comebacks (like the time a fan ran out onto the field and helped us beat the Red Sox), when I stumbled upon a video of Jose Canseco hitting a bomb into the upper deck in left field at the Stadium. No, not as a visitor with the Athletics, Rangers Red Sox, Blue Jays, Rays or White Sox, but as a Yankee. Let’s talk about how that came to be, shall we? The year was 2000, and Canseco had entered his second year as a Tampa Bay Devil Ray (yep, they were still the Devil Rays). After hitting 34 homers as a 34 year old in 1999, it seemed Jose had plum run out of steroids (and back pain pills), and was hitting .257/.383/.450 with just 9 homers and 30 RBI in 61 games. In August, the Rays put Canseco on Waivers, as many teams do with many players after the July 31st non-waiver trade deadline passes. Fortunately for Canseco, there were lots of teams that needed a right-handed power bat. Unfortunately for the Yankees, their big division rivals, the Blue Jays, were one of those needy teams. Rather than risk the Jays nabbing Canseco from the Rays, the Yankees put in a claim. 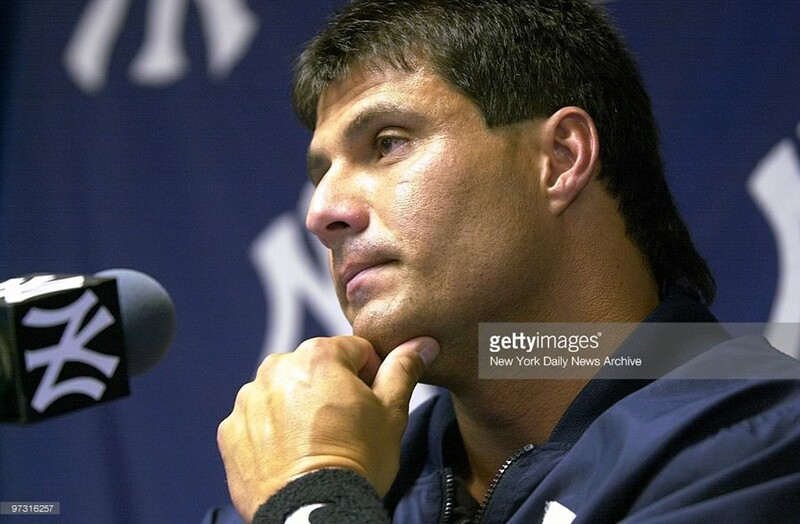 Normally, the Rays and Yankees would then have negotiated a trade, or the Rays would have just pulled Canseco back off of waivers. Instead, the Rays just let the Yankees have the Cuban slugger for free. Uh… That’s not supposed to happen, guys. Brian Cashman, and the Yankees, were left holding the proverbial bag (of steroids), and now had to accommodate Canseco on their roster. The bad part is that the Yankees already had Glenallen Hill and Shane Spencer as right handed power options, not to mention a full outfield, with Paul O’Neill, Bernie Williams and David Justice. There was no room for Jose at the inn. Joe Torre made the best of it, but there wasn’t a lot of playing time to be had for Jose. He ended up getting into 37 games, somehow, hitting .243/.365/.432 with 6 homers and 19 RBI. For some reason, he ended up on the Yankees World Series roster, getting one at bat and striking out. He was let go in the off-season, and finished his career after a year with the White Sox. After that, to hear him tell it, he was blackballed from the game for speaking the truth about steroids. If you look at the stats, its more likely that he had just reached the end of his talent, and not even the most steroidy steroids in the world would have gotten him back to his prime talent level. Over his career, Canseco spent 17 years in the major leagues, hitting .266/.353/.515 with 462 homers, 1,407 RBI and 200 stolen bases. He won the 1986 American League Rookie of the Year, the 1988 MVP (as the first ever 40 homer/40 stolen base player in big league history) and played on two world championship teams. Sure, his entire career was based on performance enhancing drugs, and his Yankees tenure wasn’t the most memorable in history, but he shouldn’t be forgotten either.